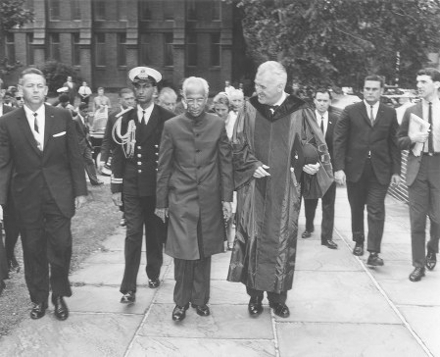 Indian President Sarvepalli Radhakrishnan and Penn President Gaylord P. Harnwell walking across the Penn campus. (June 5, 1963). With the outbreak of global war in the same year, Brown’s words seem almost prophetic in hindsight today. By the end of the war, the US Army Specialized Training Program was created to train personnel in the languages and cultures of the areas to which they were posted, and Penn became the national site for the India program in 1943-44. Using this program as a model, Brown devised a summer program of study, providing an interdisciplinary view of India’s culture, history, politics, and economics. In 1947, Brown realized his long awaited dream with the offering of an experimental summer program at the University of Pennsylvania called “India: A Program of Regional Studies.” During the summer and fall of 1947, the Carnegie Corporation of New York, and the Rockefeller Foundation provided substantial grants to Penn, allowing for a fuller implementation of Brown’s vision to form the first academic department devoted exclusively to the study of the South Asia region in the United States. Offerings were expanded over the next two years finally culminating in an operationally ‘complete’ program for the 1949-50 academic year. Following the founding of Penn’s South Asia studies department, similar moves were made at the University of California (Berkeley), the University of Chicago and Columbia University. Brown continued to be an important figure in the national effort to define, organize and implement “international area studies” on an interdisciplinary model, and lobbied for the continued support of Area studies by the US Department of Education. In 1961 the American Institute of Indian Studies, an organization which awards junior and senior fellowships for advanced research in India, was founded at Penn by Norman Brown. Penn continued to be a leader in the field of South Asia studies in the 1960s and 70s, as disciplines outside the department (History, Politicial Science, Anthropology and English) introduced positions focusing on South Asia. In the late 1980s Penn was at the center of debates regarding the critiques of both ‘Oriental Studies’ and ‘Area Studies’, and was very much at the forefront in the search for more relevant perspectives. If the Oriental Studies model, rooted in European colonialism, had prioritized language over discipline, and the model of Area Studies, rooted in US imperialism, had privileged discipline over language, a revitalized South Asia Studies Department at Penn has sought to develop a new model in which languages and disciplines interacted in a dynamic interplay. The department has thus sought to combine strengths in philology and language with larger humanities and social science disciplinary foci. At present, one can study Sanskrit, Hindi, Urdu, Bengali, Tamil, Kannada, Telugu, Panjabi, Malayalam, Marathi and Gujarati at Penn, as well as take courses in the disciplines of History, Literature, Anthropology Art History and Religious Studies.